AideRSS analyzes RSS/blog feeds to determine the popularity of each item according to the number of comments, Diggs, Del.icio.us bookmarks, backlinks and clickthroughs. One of the most useful features of AideRSS for bloggers is the ability to analyze the popularity of items in your own blog feed. Consequently, you can use this data to create a widget of your highest ranking feed items - your popular posts - which can be displayed in a widget in your sidebar, which is very easy to install! To begin analyzing the rank of items in your own blog feed, simply visit the AideRSS homepage and type your blog's RSS feed URL into the box. If you use Feedburner to burn your Blogger feed, enter the URL of your Feedburner feed (eg: http://feeds.feedburner.com/YOUR-FEED-NAME). Once you've taken a look at the popularity of your most recent posts, you can go ahead to create your popular posts widget by clicking the "Sharing and Widgets" link near the top right of the screen. This page displays a preview of what your widget would appear like on the left, and the code you can use to display this widget to the right. The Number of Posts: by default, this is set to 5. Simply replace this variable with the actual number of posts you would like to display. 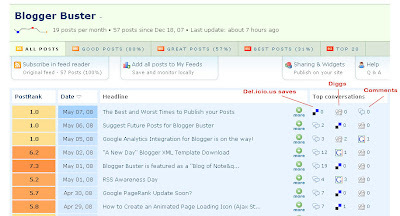 There is no need to register with AideRSS to analyze your blog feeds or use the popular posts widget. Once you have first analyzed a feed URL using this free service, you will be able to access the data anytime you like. This popular posts feature is not the only useful aspect of AideRSS. You can also use this free service to save time by filtering your feed subscriptions to display only those which you may be interested to read. Also, Jake Luciani used AideRSS functionality to research the best time of day to publish blog posts. You can learn more about this popular internet startup on the AideRSS about page, and get a feel of what this system is capable of by looking through the API pages. Please let me know what you think about this widget by leaving your comments and opinions below.